Tucker Hughes, middle, is flanked by Nitros pitching coach Pete Horner (left) and hitting coach Sebastian Guillen. 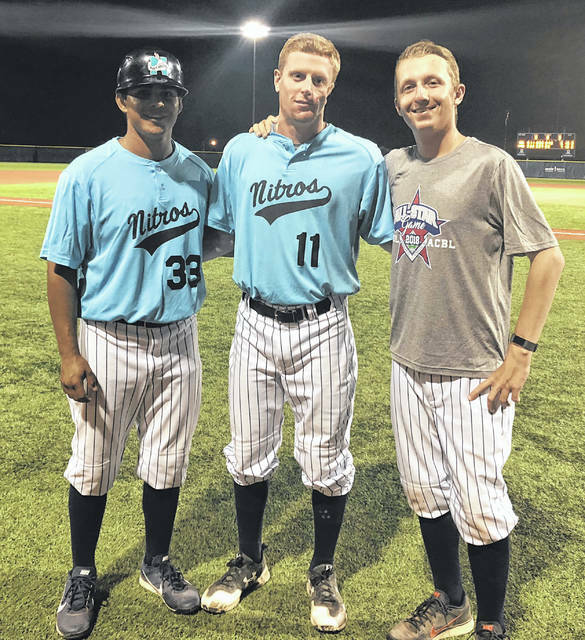 Tucker Hughes, manager of the Wellsville Nitros, was recently selected as the manager for the New York Collegiate Baseball League All-Star team. The NYCBL All-Stars competed in a game against the Atlantic Coast Baseball League and the NYCBL ended the night with a 7-6 victory. “It was one of the greatest experiences of my life,” Hughes said. “Being out on the field with so many great players was a sight to see. These guys have all worked extremely hard to get where they are and I’m proud of all they have accomplished. Hughes and the Nitros are back in action with two weeks left of the NYCBL season and are working to capture the first NYCBL Western Division title since 2006.